The Village of Key Biscayne and The Key Biscayne Community Foundation present the 2019 Winter Music Concert series. 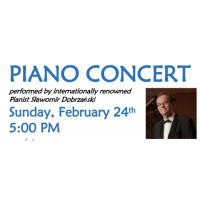 This Concert features Stawomir Dobrazanski, an international renowned pianist who graduated from the Chopin Academy of Music in Warsaw, Poland and the University of Connecticut, where he received a Doctor of Musical Arts Degree. A complementary wine and cheese reception will be served.